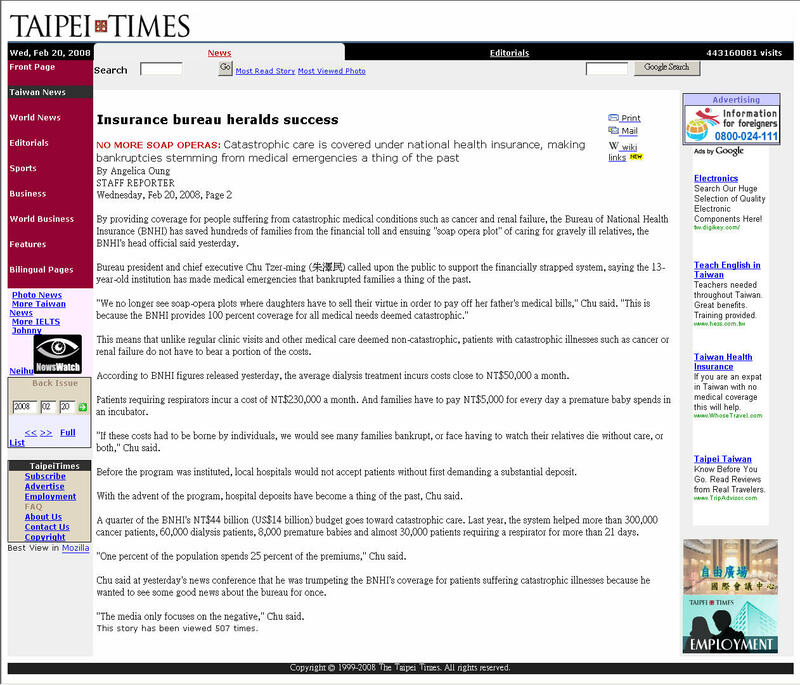 By providing coverage for people suffering from catastrophic medical conditions such as cancer and renal failure, the Bureau of National Health Insurance (BNHI) has saved hundreds of families from the financial toll and ensuing "soap opera plot" of caring for gravely ill relatives, the BNHI's head official said yesterday. Bureau president and chief executive Chu Tzer-ming (朱澤民) called upon the public to support the financially strapped system, saying the 13-year-old institution has made medical emergencies that bankrupted families a thing of the past. "We no longer see soap-opera plots where daughters have to sell their virtue in order to pay off her father's medical bills," Chu said. "This is because the BNHI provides 100 percent coverage for all medical needs deemed catastrophic." This means that unlike regular clinic visits and other medical care deemed non-catastrophic, patients with catastrophic illnesses such as cancer or renal failure do not have to bear a portion of the costs. According to BNHI figures released yesterday, the average dialysis treatment incurs costs close to NT$50,000 a month. Patients requiring respirators incur a cost of NT$230,000 a month. And families have to pay NT$5,000 for every day a premature baby spends in an incubator. "If these costs had to be borne by individuals, we would see many families bankrupt, or face having to watch their relatives die without care, or both," Chu said. Before the program was instituted, local hospitals would not accept patients without first demanding a substantial deposit. With the advent of the program, hospital deposits have become a thing of the past, Chu said. A quarter of the BNHI's NT$44 billion (US$14 billion) budget goes toward catastrophic care. Last year, the system helped more than 300,000 cancer patients, 60,000 dialysis patients, 8,000 premature babies and almost 30,000 patients requiring a respirator for more than 21 days. "One percent of the population spends 25 percent of the premiums," Chu said. Chu said at yesterday's news conference that he was trumpeting the BNHI's coverage for patients suffering catastrophic illnesses because he wanted to see some good news about the bureau for once. "The media only focuses on the negative," Chu said.